I specialize in creating personalised web sites for creative individuals looking for a way to display their archive in their own way. Sites can be built around your own designs and typically would use a database to create each page allowing clients to add and edit their own material with a minimum of fuss. Where necessary there would be a content management system tailored to the client’s requirements. I have created sites for artists, photographers, craftsmen and composers to explain their work and, where required, to provide a method for them to sell or distribute their creations. All sites are created from scratch and are individually tailored to the clients needs and resources. I do not use templates or Wordpress type frameworks, but if you are intending to include a blog then can do so. If you do not already have a hosting account or domain name then I can arrange these for you as well. 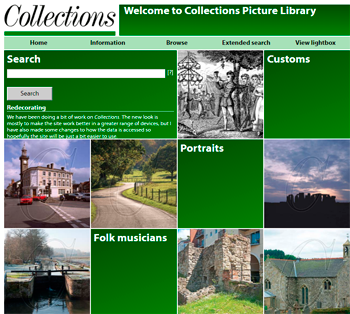 Collections is a picture library specialising in just the British Isles. The astoundingly varied landscapes, cities, towns, villages and buildings of the British Isles from pre-historic times to this very day, the people, the industries, events, customs and traditions - and almost everything else to be found in these unusually interesting islands. I am primarily a web designer these days, but I trained and spent many years working in graphic design. 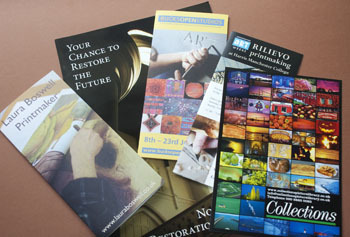 I can provide artwork for leaflets, brochures, programmes and arrange printing or liaise with your printer. A browser based management programme for printmakers. It enables you to keep track of all prints in an edition, generate delivery notes to galleries, do invoices and keep track of payments. It would be individually tailored to each printmaker’s needs and can be integrated into a web site to control what appears in an on-line gallery. Modules can be added to handle other forms of merchandise like greetings cards or giclee prints. I can also arrange the services of various other creative professionals including photographers, illustrators and artists. Please ask. Laura Boswell is a printmaker specialising in Japanese woodblock and linocut and also my sister-in-law. She provided me with hand drawn layouts which I translated into this site. I also created an extensive back-end that allows her to upload new work, create delivery notes and invoices for sending to galleries, manage stock control and review accounts. A personal site for my brother to promote his own work, in particular to showcase his ongoing project to photograph craft potters in Britain. The site is driven by a database making it easy for him to add new material as he shoots it. My father, Brian Shuel, is a professional pfotographer with a career that regularly involves folk music and traditions. The pictures on this site are also on the Collections Picture Library site and the development involved working out how to extract and display the same data in a different way from how the database was originally intended to be used. Collections Picture Library is a picture library specialising in all aspects of the British Isles with a particular emphasis on traditional calendar customs. I created the web site from scratch in order to drastically reduce the cost of licensing and hosting our previous site and learned a lot of valuable lessons that I have been able to carry over to later work. James Boswell was an artist and illustrator and my Grandfather. When the site that was previously devoted to him was removed (it wasn’t under my control at the time!) we decided to completely rebuild it. The writing has been much expanded, but crucially I have created a database driven archive of his pictures, which were largely absent in the previous version, that can be added to easily as more of his work is located and scanned or photographed. A site for film maker Mike Dibb that is adaptable enough to display text articles, stills and film clips. It includes a back end content management system that allows Mike to add and edit entries in a variety of formats and from a variety of sources. Sal Shuel is an authority on copyright as it applies to the photographic industry and her site is an authorative laymans guide. It includes facilities to edit, add or remove entries, add and remove images and change the way they display. Michael George is a well known photographer now based in East Sussex with extensive archives of his time in New York and around the world. He required a picture library style site that can be easily added to and allows him to market prints, rights and books. Anthony Gilbert is a well known modern classical composer. He needed a site that would display his catalogue in various formats and allow him to add new pieces as well as displaying forthcoming events when needed. David Lumsdaine is also a composer. Largely retired now, he did not require the updating facilities, but did want a way of displaying programme notes and lyrics in a format they could easily be copied for concert programmes. He also wanted a photo gallery and slideshow. An extensive guide and explanation of many of the traditional calendar customs of the British Isles. Using resources from the Collections Picture Library site, but greatly expanded by Brian Shuel on whos archive the collection is based. Malcolm Crowthers is a noted photographer specialising in portraits of people in the classical music world and theatre. His main requirement for the site was to provide slide shows of his work. Hertfordshire’s Five Gold Rings was a collaboration between five housing associations and Hertfordshire County Council to celebrate the Olympics and encourage musical participation within the county. The site had to be able to display details of events along with a calendar (no longer displayed as the project is now complete!) and divide the events up by housing association where necessary as well as providing links to where further information could be found.